W. W. Norton & Company, 9780393082838, 312pp. We live in an age of connection, one that is accelerated by the Internet. This increasingly ubiquitous, immensely powerful technology often leads us to assume that as the number of people online grows, it inevitably leads to a smaller, more cosmopolitan world. We'll understand more, we think. We'll know more. We'll engage more and share more with people from other cultures. In reality, it is easier to ship bottles of water from Fiji to Atlanta than it is to get news from Tokyo to New York. In Rewire, media scholar and activist Ethan Zuckerman explains why the technological ability to communicate with someone does not inevitably lead to increased human connection. At the most basic level, our human tendency to "flock together" means that most of our interactions, online or off, are with a small set of people with whom we have much in common. In examining this fundamental tendency, Zuckerman draws on his own work as well as the latest research in psychology and sociology to consider technology's role in disconnecting ourselves from the rest of the world. For those who seek a wider picture--a picture now critical for survival in an age of global economic crises and pandemics--Zuckerman highlights the challenges, and the headway already made, in truly connecting people across cultures. From voracious xenophiles eager to explore other countries to bridge figures who are able to connect one culture to another, people are at the center of his vision for a true kind of cosmopolitanism. And it is people who will shape a new approach to existing technologies, and perhaps invent some new ones, that embrace translation, cross-cultural inspiration, and the search for new, serendipitous experiences. 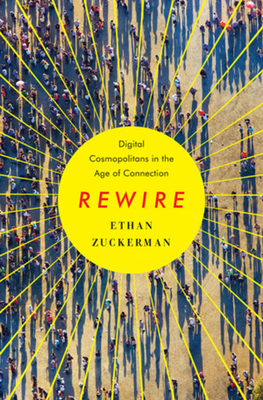 Rich with Zuckerman's personal experience and wisdom, Rewire offers a map of the social, technical, and policy innovations needed to more tightly connect the world.